Robert Charles Christian was born on October 17, 1945, in Chicago to a family of Dutch and Scots-Irish descent. His family would move to Southern California early on in his childhood and would remain in the city of El Cajon throughout his childhood. It was there that he would begin to be involved in sports and eventually would lead him to a career in professional baseball. Bob attended Magnolia Elementary School for eight years before moving on to El Cajon Valley High School, where he would graduate in 1963. While attending high school, he developed into a three-sport athlete by competing in baseball, basketball, and football. He continued his academic and athletic career by attending Grossmont Junior College in El Cajon for two years. While attending the junior college, he was a member of the baseball and football teams. His baseball career that began on the Little League, Pony League, and Colt League fields of El Cajon, advanced to the professional level when he was signed as an amateur free agent by the New York Yankees in 1964. Gordon (Deacon) Jones signed him to his first contract as a right-handed-hitting third baseman for the Yankees. Bob weighed 180 pounds and stood 5-foot-10 as he began his climb up the ladder to the major leagues. The climb began with him playing for Johnson City of the Appalachian League in 1964. He saw action in 58 games and finished with a .319 batting average, which was good enough to finish fourth in the race for the league batting title. He had 76 hits, 6 doubles, 2 triples, 3 home runs, and 28 RBI, in his first professional season. He led the league’s third basemen in fielding percentage, coming in at .833. Based on his accomplishments, he was named to the Appalachian League all-star team. Due to his potential, the Detroit Tigers acquired him by selecting him in the first-year player draft November 30, 1964. 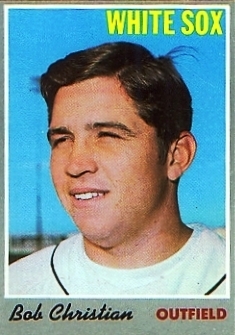 The following spring, the Detroit organization sent him to the Daytona Beach club of the Florida State League where he played 139 games during the 1965 season. He finished sixth in batting with an average of .274 with 135 hits, 13 doubles, 5 triples, 1 homerun, and 57 RBI. Defensively, he led the league’s third basemen with 293 assists, 472 chances—and 52 errors. Also, for the second consecutive year, he was chosen to be on the league all-star team. Before beginning the new season, Bob married Vicki Lynn Manahan on January 29, 1966, and had two children. During the 1966 season, Bob spent the majority of his time at Rocky Mount in the Carolina League. He played in 103 games there and batted .276 with 101 hits, 9 doubles, 2 triples, 7 home runs, and 49 RBI. He also hit .269 in 17 games with Montgomery of the Southern League. Christian stayed with Montgomery for the entire 1967 season. Due to recurring arm problems, Bob became the regular second baseman for Montgomery rather than third base as he had played the three previous seasons. He had been bothered by a sore arm off and on since 1965. He played in 126 games and finished eighth in the league batting race with a .274 average. His batting totals included 116 hits, 17 doubles, 6 triples, 10 home runs, and 53 RBI. The 1968 season proved to be his best in professional baseball. He began the year with Triple A Toledo of the International League, which put him one step away from the Detroit Tigers’ major league roster. In spring training, he was back playing his original position of third base, but experienced some difficulties due to the arm problems that seemed to be following him. Because of these problems, he was not in manager Jack Tighe’s opening day lineup for Toledo. He played third base in the third game and then for a few days after that, but he seemed unsteady and unsure of himself. On May 1, his manager moved him to the outfield and things started improving for him almost immediately. In a Sporting News article from June 1968, he said, “I was a little tense and felt the pressure at third base, possibly because of moving up to Triple A. I’m more comfortable and more relaxed in the outfield. I don’t worry about my fielding, as I had been doing at third base, and I’m able to concentrate on hitting.” Concentrate on his hitting he did, Christian had a 14-game hitting streak (only two away from the club record at the time) that was stopped by Jacksonville’s Gary Gentry, who defeated Toledo with a two-hit shutout. Bob began an eight-game hitting streak the next day by getting four hits. By hitting safely in 22 of 23 games, he was leading Toledo with a .365 batting average by the latter part of May. He was able to get three hits in a game on three different occasions during his hitting tear. His key hits also included a two-run homer in the seventh inning that broke up a three-hit shutout by Jacksonville’s Tug McGraw. His hitting success did little to change his humble attitude, though. He credited his high school coach from El Cajon Valley, Harry Elliot, with helping him develop his style of swinging down on the ball in order to hit more line drives rather than pop-ups. Christian also spoke highly of veteran teammate Lenny Green, whose left-field job he had taken: “Lenny has been very good with the younger guys on our club. In my case, he suggested I shorten my swing by bringing the bat down and in closer to my body. The big thing is that I have better control of the bat and I’m getting into the pitch more quickly.” Christian played 123 games for Toledo and finished second in the league with a .319 batting average and 151 hits. He also had 16 doubles, 7 triples, 5 home runs, and 57 RBI. He was an IL all-star team member and as the season wore on, the parent club took notice of his hitting exploits, eventually calling him up in September. Christian made his major league debut September 2 with Detroit against the Oakland Athletics and had one at-bat without getting a hit. In his three at-bats with Detroit that month, he collected one hit, a double. He played in just one game defensively, splitting time between first base and the outfield. On September 30, 1968, Christian was purchased from Detroit by the Chicago White Sox as part of the midseason trade for Don McMahon. The early portion of the 1969 season was affected by Bob’s six-month stint with the Army Reserve. He returned from duty in late May and was sent to play with Tucson in the Pacific Coast League. Christian played 49 games combined there during two stints and batted .240 with 37 hits, 3 doubles, 2 triples, 1 home run, and 17 RBI. He returned to the big leagues with the White Sox when Buddy Bradford was put on the military list and went into the National Guard in late June. By August, Christian was in a position to finish out the season with the White Sox, playing in 39 games and batting .217 with 28 hits, 4 doubles, 3 home runs, and 16 RBI overall. Despite his six years of experience, Christian had the appearance of a “baby-faced” youngster and was known for his shy demeanor. White Sox manager Don Gutteridge attested to that saying, “He’s kind of quiet, he doesn’t say much, but he’s been making noise with the bat lately.” The noise that he was referring to included a ten-game hitting streak in September. He also was making noise with his glove, including two instances where he had to dive into the stands in order to catch the ball and retire the batter. Gutteridge conceded at that point that Christian could wind up as one of the regular outfielders and that he probably would have had a good chance going into the 1969 season if his military service had not caused him to have a late start. Christian played with the White Sox entry in the Florida Instructional League following the regular season, batting .280 in 26 games. Bob was able to start the 1970 season with the White Sox and played in 12 games before being sent back to Tucson. In those twelve games, he batted 15 times with an average of .267, with 1 home run and 3 RBI. His appearance May 24, 1970, was the last of his major league career. He went to Tucson and played in 62 games and batted .333. He had 73 hits, 16 doubles, 4 triples, and 40 RBI. He was placed on Tucson’s winter roster for the following season, but on March 27, 1971, he was given his outright release from the Tucson ball club. He had an opportunity to play in Japan that season. He signed on with the Tori Flyers and ended his professional baseball career playing in Japan. As his baseball career was coming to a close, his life was also approaching an unforeseen ending. Bob Christian became ill with leukemia and on Wednesday, February 20, 1974, in San Diego, he succumbed to the disease. He was 28 years old and left behind his wife, Vicki, and two children. His major league totals include parts of three seasons with the Tigers and White Sox. He played in 54 games, had 147 at-bats, scored 14 runs, had 33 hits, 5 doubles, 4 home runs, 19 RBI, 3 stolen bases, 11 walks, 23 strikeouts, an average of .224, an on-base percentage of .278, and a slugging percentage of .340. Defensively, he notched 43 games in the outfield and one at first base, had 71 putouts, 3 assists, and 3 errors for a fielding percentage of .961. The Sporting News, June 1968 and October 1969. Bob Christian clip file, National Baseball Hall of Fame and Museum Library.